With all of the recent buzz over Buzz and privacy issues, I'm curious what you all think of a new service from Google called AdPlanner. Instead of people being worried about their privacy, now we get to have companies themselves worried about their competitive advantage. For all I know, the information in these images is generally regarded as confidential within companies. Now it is public knowledge for all to see. Suppose you want to rank higher in ad placements than your competition, now you know exactly which keywords to bid more on. 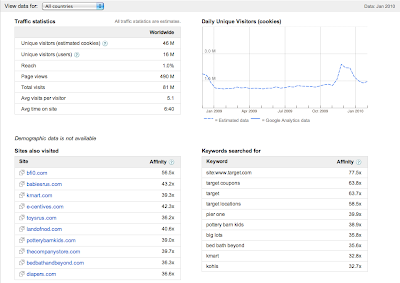 You get a nice list of sites that people also visit (and can get their keywords). 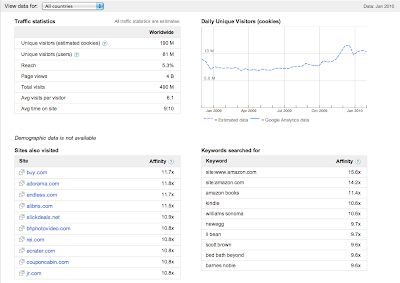 You can also compare the amount of traffic your site receives against someone else. If their traffic is down and yours is up, you now know that they will most likely be trying new tactics to take traffic away from you. The daily unique visitors trend is also interesting in that around December, there is a clear traffic spike on these two major retailers for the holiday season. 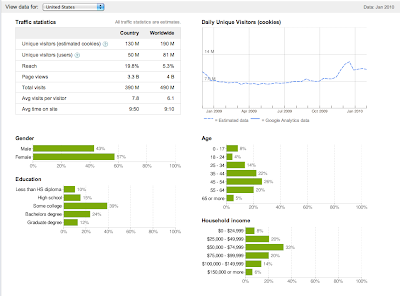 Just wait, this gets better... if you look at the data for specific countries, you also get user profile data! This is information that I know some sites pay a lot of money to consultants for. Thanks google for giving it away for free now!